UK Poker News was pleased this week to be granted an exclusive look at the new "Loose Cannon Sports Bar &amp; The VC Players' Lounge" that is being opened by UK poker legend Roy Houghton, and to chat to Roy himself about his new venture as well as a colourful recap of his poker past. That interview will be published very soon but now – with thanks to The Poker Agency - we publish what is on offer to City of London poker players in the very near future at the Loose Cannon! After 40 years working in the world of poker, Roy Houghton has accomplished his lifelong dream. "Loose Cannon Sports Bar &amp; The VC Players' Lounge" is now open for founder member registration. The venue is situated in a stunning 10,500 square foot listed building in Allhallows Lane, EC4, minutes from Cannon Street Station in the heart of the City of London. Poker will flourish at Loose Cannon's under the innovative directorship of a man who has achieved so much in the promotion of the game of poker. Roy ran the first UK poker tournaments, created the Double Chance Freeezeout and Mammoth Hold'em poker formats. 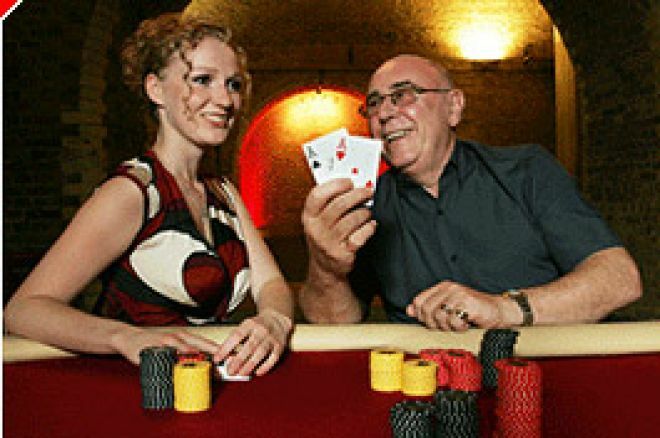 Anyone who was inspired to play poker after seeing Late Night Poker TV in the late 90's would end up at the famous Stakis Dungeon in London, which Roy managed, and at some point be heard screaming "Chips Roy!" to hear his rasping cockney voice scream back "Can't you see I'm busy?!". The Loose Cannon Club has a capacity of 450, a luxurious members' lounge and restaurant at last providing an environment for comfortable and social games play. The high ceiling and space in the VC Player's Lounge and Games Rooms will allow for elbow room and breathing space at any of the four major festivals the club will hold. Naturally the club will boast a Salon Privé for private events. Roy will provide another first by promoting the concept of limit cash poker in the UK, providing a valuable opportunity for those fresh to the game of poker. Backgammon and all games players can expect an exciting calendar of major events. By virtue of its unique location, the Loose Cannon club will finally provide for the huge interest in poker from The City's financial players, who will now have a venue on their doorstep. In working in accordance with the City of London, Police and Gaming Commission, all games will carry no charges or levies. There will be a quarterly membership fee which, once established, will provide much more than just value for money play. Roy said, "I am opening the club for trial founder membership registration from the 12th of September 2006 for which there will no charge. After the stress of the last 14 months' preparation, I can't wait to show the club off. I want to offer a venue that gives more than any other". Don't forget to check back here at UK Poker News for our exclusive chat with Roy Houghton. Ed note: Roy Houghton has chosen VC, so why not download VC Poker and earn a $500 bonus!